Gadzinsky, Volodymyr [Ґадзінський, Володимир; Gadzins'kyj (pseudonyms Yosyf Hrikh, Oskar Reding, Trylsky)], b 21 August 1888 in Cracow, d 11 August 1932 in Odesa. Poet and critic. 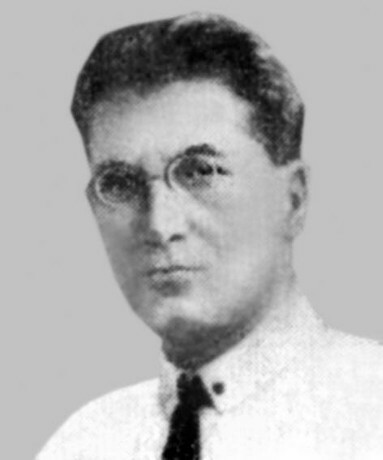 From 1919 he lived in Soviet Ukraine, where he worked as an editor and belonged to the writers’ organizations Hart and the All-Ukrainian Association of Proletarian Writers. In 1924 he headed the association of Ukrainian writers, Selo i Misto (SiM) in Moscow. His literary output consists of the poetry collections (mainly narrative poems) Z dorohy (From the Road, 1922), Ainshtain, Zemlia (Einstein, Earth, 1925), USSR (Ukrainian SSR, 1925), Zaklyk chervonoho renesansu (The Call of the Red Renaissance, 1926), and Ne—abstrakty (Not—Abstracts, 1927); the novelette Kinets' (The End, 1927); and two books of literary polemics, reviews, and criticism: Na bezkrovnomu fronti (On the Bloodless Front, 1926) and Fragmenty stykhiï (Fragments of the Elemental Force, 1927). Persecuted during the Stalinist terror, he committed suicide.